Mikhail Kusnirovich, head of BOSCO has also planted flowers. Visitors to the Russian capital can enjoy a display of 586,000 flowers of 28 types at Moscow's famous shopping arcade as part of a month-long festival. Moscow's most famous shopping arcade GUM has been turned into a huge botanical garden as part of a flower festival that will last until the end of July. 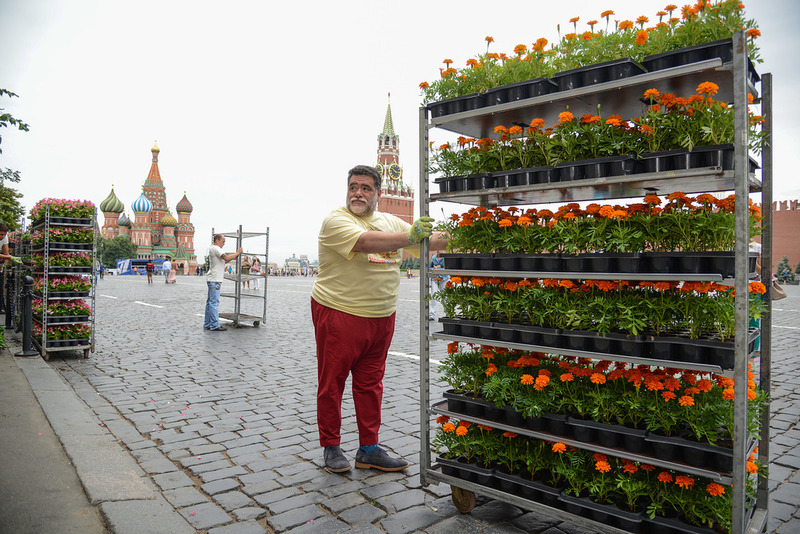 As part of the event, which began on June 28, 586,000 flowers of 28 different types have been planted around and inside the store on Red Square. The festival, organized by the BOSCO creative team, is being held at GUM (State Universal Store) for the fourth time. A number of Russian celebrities joined the organizers in planting the flowers. "It's amazing when natural flowers are growing inside the store. It reminds [you] of home, the dacha and everything that is cozy and pleasant to us," said actress Yuliya Peresild. One of the oldest and most beautiful stores in Moscow, GUM always tries to arrange its space in an unusual way. The shopping arcade has previously featured exhibitions of retro cars, antique book sales, an ice cream festival and many other events. Visitors can enjoy the flower displays at GUM until the end of July free of charge.